It's back to Brexit again in both Houses of Parliament, after the issue of a "meaningful vote" unexpectedly detonated. 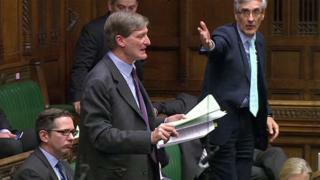 Soft Brexit/Remainer Tory MPs, led by the former attorney general Dominic Grieve, thought they had a deal with the prime minister on the issue. They had drawn back from rebelling on Tuesday on the promise of a compromise - but then discovered that the government was not offering them what they thought had been conceded. Essentially the issue is about what happens if the divorce talks with the EU run out of time, or fail to deliver a deal, or if MPs reject the proposed deal. Here comes the science bit - concentrate! On Tuesday, MPs were presented with a Lords amendment that would have given the power to MPs to direct the government's next steps in those contingencies. The government offered a replacement amendment in the Commons (an "amendment in lieu" in parliamentary jargon) which gave MPs a vote on the final deal, but, crucially, did not give them the opportunity to direct the government's future strategy - what they would get instead would be a statement within 28 days, setting out how the government "proposes to proceed in relation to negotiations for the United Kingdom's withdrawal from the EU". Scenario A - MPs have voted against the withdrawal agreement - government must make a statement in the House of Commons within 28 days of MPs' vote outlining its approach. MPs must vote on what the government is proposing. Scenario B - No withdrawal agreement is reached by the end of November 2018 - MPs vote on a government motion setting out its proposed course of action. Scenario C - No withdrawal agreement is reached by 15 February 2019. Within 5 days, the government must bring it in front of MPs and follow any direction to negotiations that are voted on by MPs and debated by Lords. Having pulled back from rebellion he was expecting the government to concede most of these powers, but it was not to be - and now his Lords ally Lord Hailsham (the former cabinet minister Douglass Hogg) is to put forward his proposals in the Lords, with the aim of replacing the amendment the government won in the Commons, and kicking it back to MPs. The point is that Mr Grieve and his allies would then have a chance to press it to a vote - and quite possibly win. Both Houses have to agree on the final form of legislation before it can become law, and this intricate process - "ping pong" in Westminster-speak - is how MPs and peers reach an agreed wording. So on Monday we will have the Lords votes on the changes made by the Commons. Peers will probably accept most of them, but the Hailsham amendment looks set fair to be accepted (the previous version was passed by a majority of 91 votes) and it will then be kicked back to the Commons, for consideration on Wednesday. Will it win there? The government has a narrow majority with its DUP allies, but if the group around Mr Grieve vote with Labour and the other opposition parties, they would have a majority. Unless some Labour MPs broke ranks and voted with the government, or abstained. And there is a contingent of pro Brexit MPs and MPs from strongly Leave constituencies who may well do so. The arithmetic looks very tight, and the rival sets of party whips will doubtless be working very hard to minimise the number of rebels on their side. It's worth remembering that the Grieve group, unlike the Brexiteers, are not bloodied in rebellion from years of backbench insurgency - so it will be interesting to see if the iron has entered their souls, or whether they can be persuaded to relent. In the end it might even come down to MPs being taken ill or stuck on a train - but unless a new compromise is struck over the weekend, and the implication of bad faith around the previous deal may make that hard to do - we could be in for a week of drama which could prove highly destabilising to the government. Something else to watch out for is an effort to secure an Estimates Day debate on the Defence Budget; debates on these days are under a procedure which allows detailed discussion of money issues, and both the Defence Select Committee and the Public Accounts Committee are extremely concerned about the state of the Ministry of Defence finances. As luck would have it, members of both were recently together at Rossyth, for a visit to the new aircraft carrier, HMS Queen Elizabeth II, and the rumour is that a coordinated move to get the issue onto the floor of the Commons has been cooked up. The Commons opens (2.30 pm) with Housing, Communities and Local Government questions - and any statements or urgent questions will follow at 3.30 pm. Then comes the Emergency Debate secured by the SNP leader, Ian Blackford, on the Sewel Convention - the convention that Westminster seeks "legislative consent" for new laws touching on the devolved governments of Scotland, Wales and Northern Ireland. This follows the passage of amendments to the EU (Withdrawal) Bill on which EU powers will and will not be passed to the devolved parliaments, which were opposed by the Scottish Parliament. 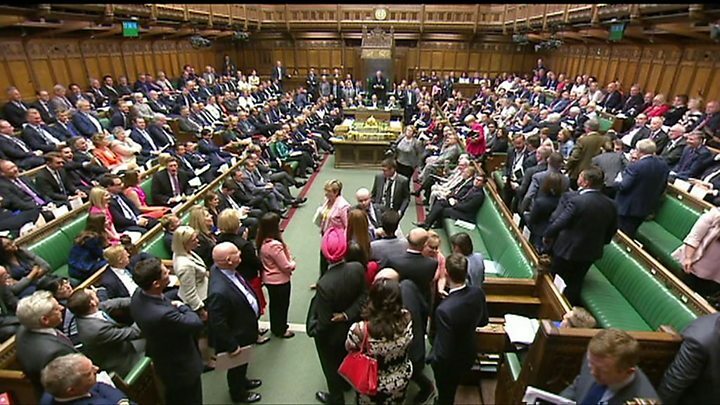 After last week's furious scenes, this could provide another flashpoint between the SNP and, in particular, the Scottish Tory MPs and the government whips - the whips have developed a habit of standing close to the SNP benches and heckling their MPs, which is much resented. MPs then deal with Lords amendments to the Automated and Electric Vehicles Bill - in what should be a pretty brief encounter, before moving on to votes on a statutory instrument on the Draft European Union (Definition of Treaties) (Canada Trade Agreement) Order and European Documents relating to EU Trade Agreements: EU-Japan Economic Partnership Agreement. And after that there is a general debate on how the NHS and other public services deal with acquired brain injuries. In Westminster Hall (4.30 pm) MPs debate e-petition 209433: "Give the electorate a referendum on the abolition of the House of Lords - the House of Lords is a place of patronage where unelected and unaccountable individuals hold a disproportionate amount of influence and power which can be used to frustrate the elected representatives of the people." The petition attracted 168,755 signatures. My committee pick is the Transport Committee hearing (4.45pm) on Rail timetable changes - when MPs will question top executives from GTR, Arriva Rail North, London North Western and Network Rail. It was announced on Friday that Charles Horton is to resign as chief executive of Govia Thameslink Railway, following months of controversy over delays and cancellations to services. Bring popcorn. In the Lords, after a half hour question time at 2.30pm, peers embark on their consideration of Commons amendments to the European Union (Withdrawal) Bill (see above). MPs kick off (at 11.30 am) with Health and Social Care questions, after which the Conservative Craig Mackinlay presents a Ten Minute Rule Bill to give Gibraltar an MP (this had been due to be debated some months ago, and was rescheduled). Then comes a Labour Opposition Day Debate on a motion (or motions) to be announced. In Westminster Hall, the opening debate (9.30am) is on Romania: the member state which will hold the EU Presidency next year, and therefore has a crucial brokering role in the final Brexit negotiations. The debate will be opened by the Conservative, Bob Blackman, who believes Romania is very keen to help, and will want to extend bilateral arrangements with the UK, post Brexit. He also wants to discuss Romanian concerns about Russian activity in the Black Sea. Labour's Helen Goodman (2.30pm) leads a debate on geothermal energy, which she says has a huge potential to provide a carbon free energy source - including in former coal communities, where decommissioned mine shafts can be used. But, she says, it does not feature in the government's energy strategy. Her aim in this debate is to raise the profile and press ministers to take the opportunities seriously. My committee corridor pick is the International Development hearing (10am) on the humanitarian situation in Gaza, with witnesses from the UN, followed by the Foreign Office and International Development and minister, Alistair Burt. In the Lords (2.30pm) peers debate the detail of the Rating (Property in Common Occupation) and Council Tax (Empty Dwellings) Bill - the measure that will allow local councils to increase the tax on empty homes. Then there is a short debate on encouraging a recovery in the population of bees and other pollinators. The Commons begins (11.30am) with half an hour of Northern Ireland questions, before moving on to the high noon of Prime Minister's Question time. The day's Ten Minute Rule Bill, from the SNP's Martin Docherty-Hughes aims to create an Armed Forces Representative Body. Time has then been set aside to consider Lords amendments to the European Union (Withdrawal) Bill (see above) and there will be a general debate on Nato. One thing to keep an eye on is a possible statement from a health minister on the findings of Bishop James Jones' independent inquiry into deaths at the Gosport Memorial Hospital. In Westminster Hall, there are debates on the UN report on the convention on the rights of persons with disabilities (9.30am-11am); the UK constitutional machinery and the frameworks for intergovernmental cooperation (2.30pm-4pm); UK and Polish war reparations against Germany (4pm-4.30pm) and insecure work and the gig economy (4.30pm-5.30pm). On the committee corridor, the Housing, Communities and Local Government Committee (9.30am) takes evidence one year on, on local authority support for Grenfell Tower survivors - there are witnesses from Grenfell United, the North Kensington Law Centre, Councillor Elizabeth Campbell, the Leader of Kensington and Chelsea Council, and Nick Hurd, the minister of state for Policing and Fire Service, with responsibility for Grenfell Tower victims work, at the Home Office. And meanwhile, there's a lively session in prospect, when arch europhile MEP Guy "the Hoff" Verhofstadt, the coordinator and chair of the European Parliament Brexit Steering Group, gives evidence to the Brexit Committee on the progress of the UK's negotiations on EU withdrawal (9.15 am) - and he turns up again in the afternoon, before the Home Affairs Committee (2.30pm) to talk about Post-Brexit migration policy. The European Parliament has to sign off on the EU side of Britain's divorce deal, so his views will matter. In the Lords (3pm), the main event is the second reading of the Courts and Tribunals (Judiciary and Functions of Staff) Bill, which seeks to remove restrictions on how judges can be deployed, so they can hear a wider range of cases. The Commons opens (9.30am) with Digital, Culture, Media and Sport questions, followed by questions to the Attorney General (10.10am) and the weekly Business Questions to the Leader of the House. The main debates are on backbench motions on the importance of refugee family reunion - the SNP's Angus Brendan MacNeil proposes a motion welcoming the fact that the Refugees (Family Reunion) (No.2) Bill was given its second reading without opposition on 16 March 2018, and calling on the government to support the bill. Then Labour MP Lloyd Russell-Moyle has a motion on the future of the Erasmus+ student exchange scheme, after 2020, calling on the government to ensure continued UK access, after Brexit. In the Lords (11am) question time marks national Yoga Day with a query on the benefits of yoga for obese school children. Peers then debate the support available to carers and the Carers Action Plan 2018 - 2020; and the implications for the UKs future trade relations following the failure to reach agreement at the G7 Summit in Canada. And then they discuss the contribution of the armed forces reserves to national security. Neither House sits on Friday 22 June.